And happy birthday to my friend Will. He and his wife have been in my life for so many years, I can no longer count them. Will is a THAT man...the one who cares, the one who drops everything for you, the one who gives unselfishly to anyone in need. Yup, that's Will. So happy birthday, friend. 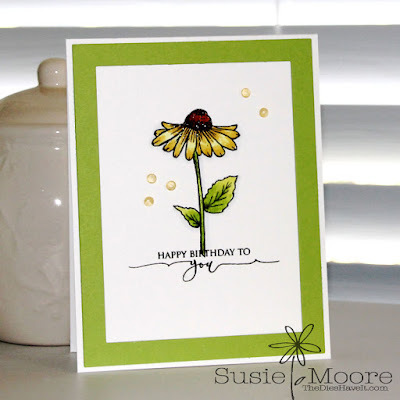 I used two Gina K. Designs stamp sets for my card. A Year of Flowers 3 is brand new and full of the most beautiful blooms. Be sure to check it out. The second set is an incentive set which will be added to any $75 dollar order for the next two weeks. It is called Scripty Sayings. I love the soft flowing look of this stamp set! I am off to create some more cards to share with you. And on Monday and Tuesday, we will be having a Blog Hop to share with you all the beautiful cards made by our design team.